Produced in partnership with Capture Festival, Richmond Public Art Program and City of Richmond. The Solarium (H+A) (2019) uses a system of custom-made mirrors and metal armatures to augment and interrupt the usual experience of photographic portraiture. The mirrors reveal alternative angles within the frame as well as objects outside of the frame while simultaneously blocking areas that would normally be visible. 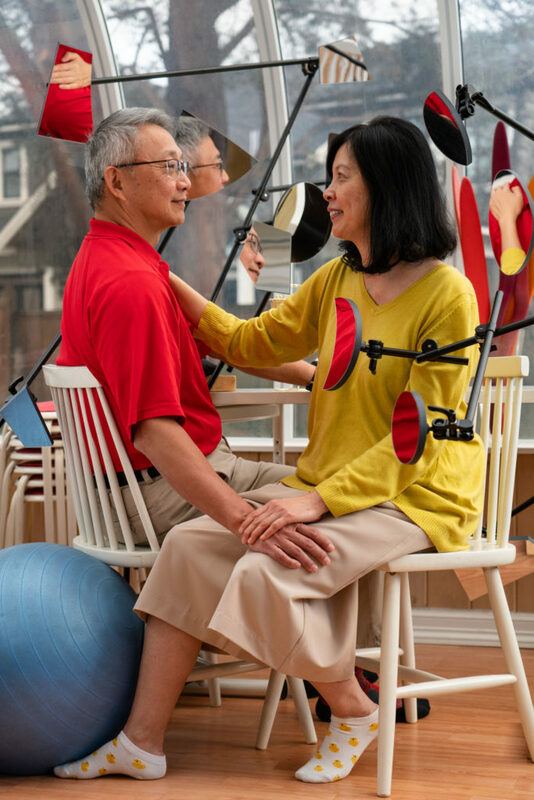 Shot in the Richmond home of the couple pictured, The Solarium (H+A) is a continuation of Adad Hannah’s interest in the history, mechanics, and technology of photography, highlighting the veracity and performativity within the photographic image. For over a decade, Hannah has been exploring historically trenchant themes through elaborate bodies of work that include installation, video, and photography. Inspired by the historical practice of tableaux vivants (translated as “living pictures”), Hannah’s work invokes the durational form of early cinema while referencing the history of photography, often through reinterpretations of art historical moments.